Modern humans are very similar to other human species, like the Neanderthals. However, there is one thing that sets us apart: the human brain1. Ours is uniquely “globular”, which is just the fancy way of saying “round”1. All of this raises the question: when did the human brain, with all its curvaceous roundness, evolve? This is a more important question that it sounds, as the change in shape increased the size of important brain bits2. A globular human (right) and non-globular Neanderthal (left) brain. It turns out it was more recent than we thought. Newly discovered fossils (and a new analysis of existing fossils) reveals the “human” brain actually evolved after modern humans did1. The data behind this new discovery comes from two main sources: the discovery of a new early human fossil, and a more thorough analysis of existing fossils. The new fossil in question is the Jebel Irhoud specimen which made a splash a while back. Hailing from Moroco, it’s now the oldest known modern human, living a whopping 300,000 years ago. The discovery of this fossil pushed the origin of our species back a good hundred thousand years or so. The Jebel Irhoud skull, along with fossil Homo sapiens we’d already found, were put through a CT scanner. The researchers used this data to create the most accurate 3D models of their brain cavity ever1. When their range of variation was charted, the results revealed what I spoiled in the intro: early modern humans lacked the modern human brain1. Ok, that chart might not reveal much at first, appearing to be just a mash of colours, dots, and arrows. Basically, it maps our brain variation. Both humans and Neanderthals evolved from Homo erectus, so their orange patch represents our ancestral form. 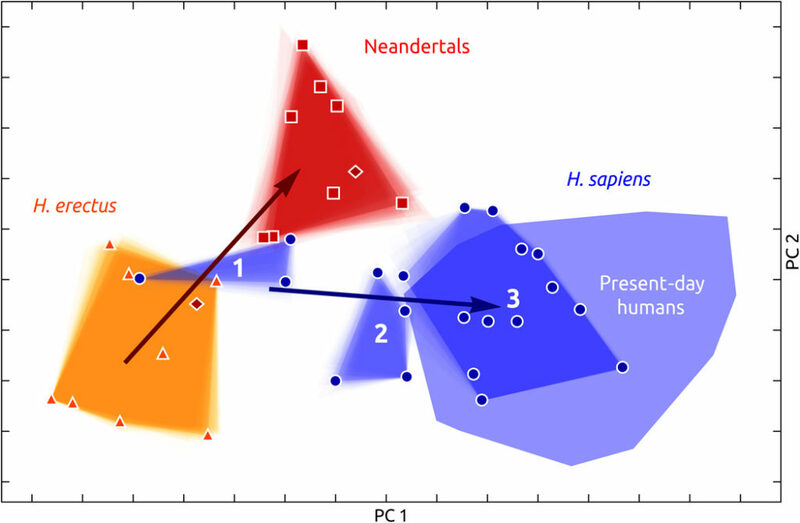 The arrows show how Neanderthals and humans evolved since then, moving into our red and blue spaces respectively1. Crucially, this reveals that early humans (the blue patch labelled 1) had a brain with a similar shape to a Neanderthal or Homo erectus. It wasn’t until after middle-aged humans (blue 2) our brain entered the range of modern humans. This means our “modern” brain evolved after blue 2 lived, 100,000 years or so ago1. So we now know the modern human brain changed over the course of modern human evolution. Our height also changed, big woop. The real question is what does this all mean? Well, the researchers went back to their CT scans to see exactly what changed between the different human groups they’d examined. This resulted in the slightly easier to follow the chart below, comparing the outline of human brains of various ages to the outline of the modern human brain (blue silhouette)1. The really important part of the chart is the green on the final stage. This highlights the areas that had changed in the intervening periods, to move us from the ancestral to the modern brain. On the off chance that you don’t have brain anatomy memorised, I’ll tell you the names of the bits with the most green. They’re the cerebellum and parietal lobe1. No doubt those names might ring a bell, regardless of you’re level brain anatomy memorisation. That’s because they’re ruddy important. The parietal lobe is linked to the senses, memory, and planning. Meanwhile, the cerebellum is involved in movement and language. Two areas I’d be happy to have made even bigger, I can be very clumsy. Unfortunately, since we’re dealing with fossils the researchers don’t have the resolution to identify exactly which part of these brain bits has changed in size, and thus can’t say why they may have changed either1. However, not knowing exactly which part of the brain changed isn’t the only issue here. Human evolution is also a lot more complex than we think. All of the charts so far have shown the evolution of our brain as a rather simple, linear process. It started like Homo erectus, before reaching modern levels after 100,000 years ago. However, the evolution of our species didn’t follow this nice, simple, linear pattern. If I’ve done my job right, you should all know we evolved in Africa, which is a pretty big place. Accordingly, early modern humans were spread out, all evolving in slightly different directions. This means that there’s much more variation in early members of our species than there is today.3. It also means our evolution wasn’t some sort of gradual tree we climbed, as the brain charts implied. It was more of a messy, branching bush3. That makes the fact the brain charts do show a simple linear patter very interesting. Although the bodies of these early humans may have been all over the place, their brains appear to cluster quite closely together (see how small the range of variation of early humans is in the first chart I showed)1. If true, this means the thing which defines humans is our brain, not our body. We can come in all different flavours, but it’s our ability to think that really defines us. At least, it seems to define us once it reached modern levels, after 100,000 years ago. Neubauer, S., Hublin, J.J. and Gunz, P., 2018. The evolution of modern human brain shape. Science advances, 4(1), p.eaao5961. 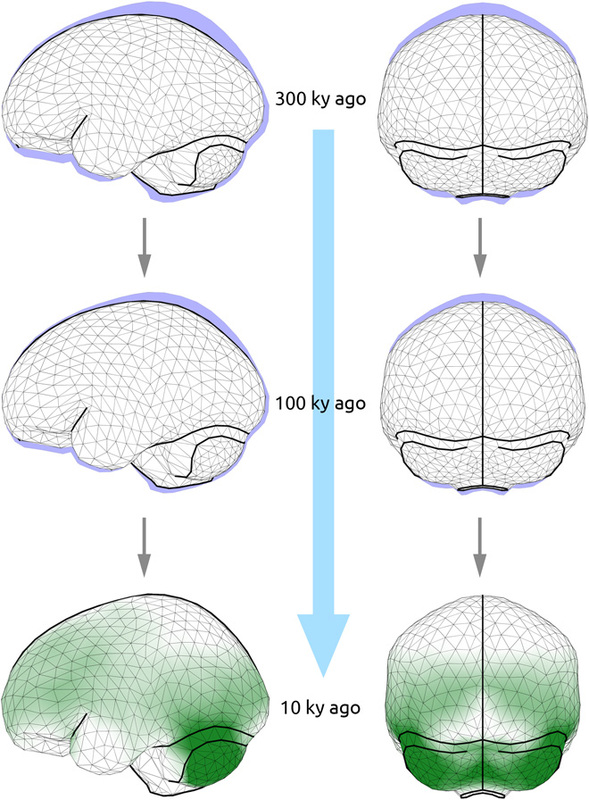 D. E. Lieberman, B. M. McBratney, G. Krovitz , The evolution and development of cranial form in Homo sapiens. Proc. Natl. Acad. Sci. U.S.A. 99, 1134–1139 (2002). Stringer, C., 2016. The origin and evolution of Homo sapiens. Phil. Trans. R. Soc. B, 371(1698), p.20150237.